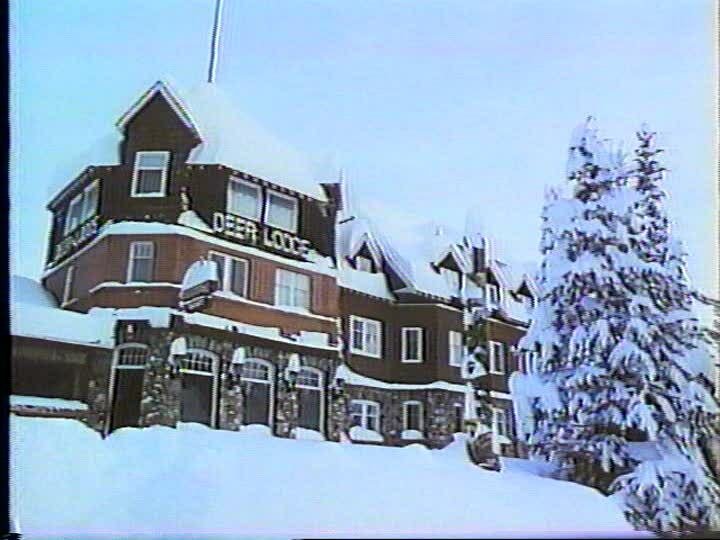 Shot in the picturesque winter wonderland of Lake Louise, Alberta, Ghostkeeper quite easily could have been one of the defining Canadian horror films of the 1980s. Taking its premise from the North American Indian legend of the Wendigo (or "Windigo," as Ghostkeeper spells it), a Northwoods-dwelling, flesh-eating monster that is one of the country's only mythical beasts, the film promises a uniquely nationalistic creature feature, but never quite unfolds that way, eventually getting lost in the snowy wilderness itself. In the film, vacationing friends Jenny (Riva Spier), her boyfriend Marty (Murray Ord) and bubbly third wheel Chrissy (Sheri McFadden) are caught in a New Year's Eve blizzard while out snowmobiling, and are forced to take shelter in an abandoned ski lodge. Only the well-kept chalet isn't as empty as they originally thoughta cantankerous old lady (Georgie Collins) soon emerges from the darkness and reluctantly agrees to let them stay for the night until the bad weather subsides. After a quiet but cozy New Years celebration, Chrissy takes a bath and is suddenly attacked by the woman's son Danny (Billy Grove), a bearded man in a toque who drags her down to a room in the basement constructed out of ice-blocks. He swiftly cuts Chrissy's throat, and gives her to another man hiding in the shadows. 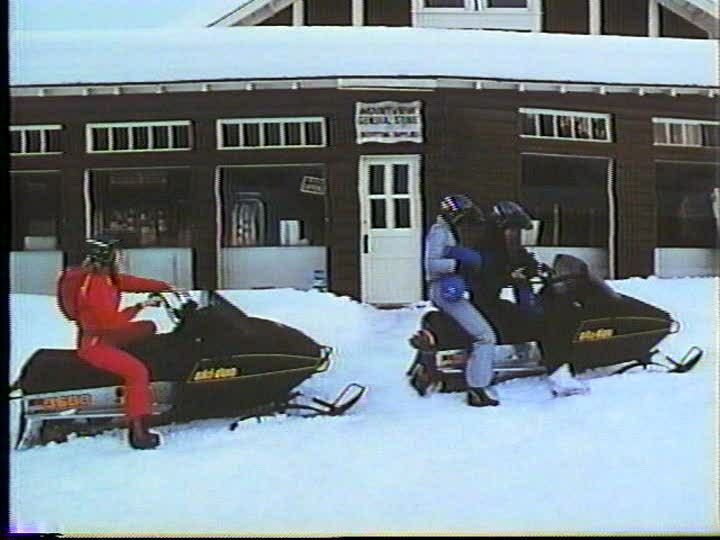 The next morning, Marty discovers his snowmobile was sabotaged during the night, while Jenny finds some news clippings of murders in the area while searching for her friend. 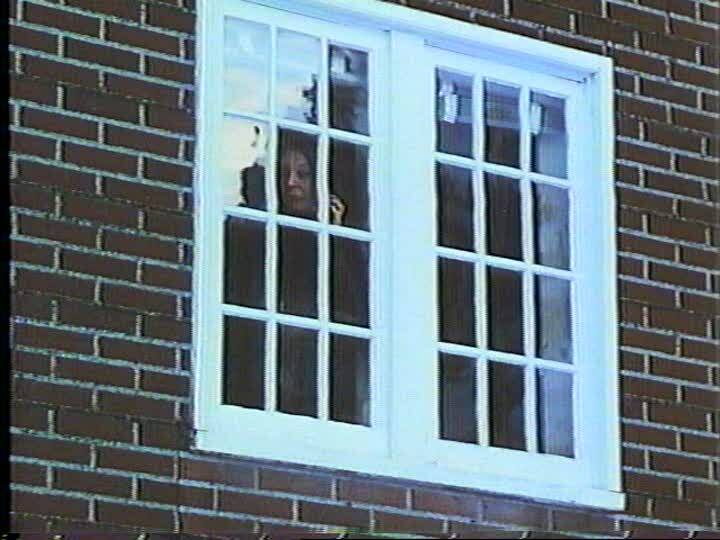 Wielding a chainsaw, Danny chases the snooping Jenny away from the basement and out on to the roof, where she accidentally causes him to slip and fall to his death. After witnessing this grisly scene, Marty drops his snowmobile tools goes off the deep-end, inexplicably marching off into the woods to freeze to death. With her friends dead, Jenny is forced to face the old lady (the titular " ghostkeeper" herself) in a final bid to escape the lodge and the Wendigo's curse. To date, no Canadian horror film has successfully adapted the homegrown Wendigo tale to the screen, and that includes the patience-testing Ghostkeeper. Rather than the enormous, deformed werewolf-like creature with a heart of ice of legend, however, this Wendigo would appear to be nothing more than the mysterious figure living in the basement--a regular hoser not much different from Danny, except maybe for its slightly longer hair. Perhaps writer/producer/director Jim Makichuk is playing with our perceptions, and the basement-dweller might simply be an insane, child-like killer, or even a figment of Jenny's imagination, but it's difficult to tell, since Ghostkeeper only makes a few oblique references to the Native American legend, and the ill-fitting title of the film doesn't do much to clarify Makichuk's muddy script. 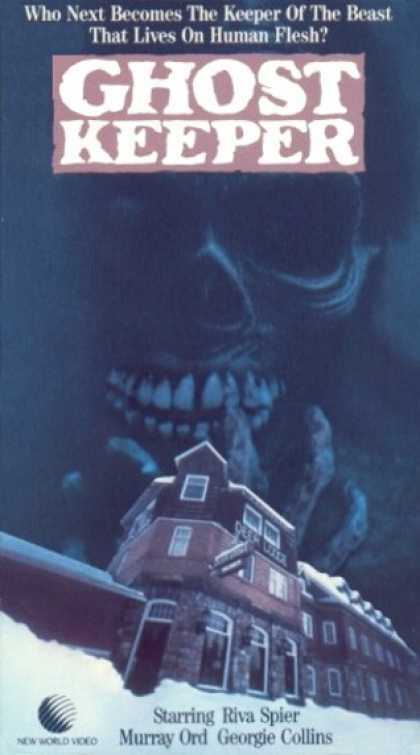 Despite obviously borrowing several elements from Stanley Kubrick's earlier horror classic The Shining, Ghostkeeper also bears similarities to Paul Lynch's Ontario-shot Humongous, and not just because some of the scenes on the VHS tape are so dark that much of the action is completely indistinguishable. Both films feature an eerie manor located in the secluded wilderness where an insane and neglected creature is forced to feed off of whatever he can get his hands on, but where Humongous is clearly modeled on the slasher films of the time, as the creature gradually eats his way though a cast of wayward teenagers, Ghostkeeper's intensely decadent adult protagonists sleepwalk through a slow-burning atmosphere as they share their deepest secrets, analyze their crumbling relationships, and contemplate cheating on each other. The muted, claustrophobic setting and Paul Zaza's creepy score--one of the best of his career--do contribute to the film's foreboding mood, but Ghostkeeper is still confusing and plodding, with a final twist that strongly favours literary convenience over believability. Still, few Canadian genre films are as blatantly patriotic as Ghostkeeper. 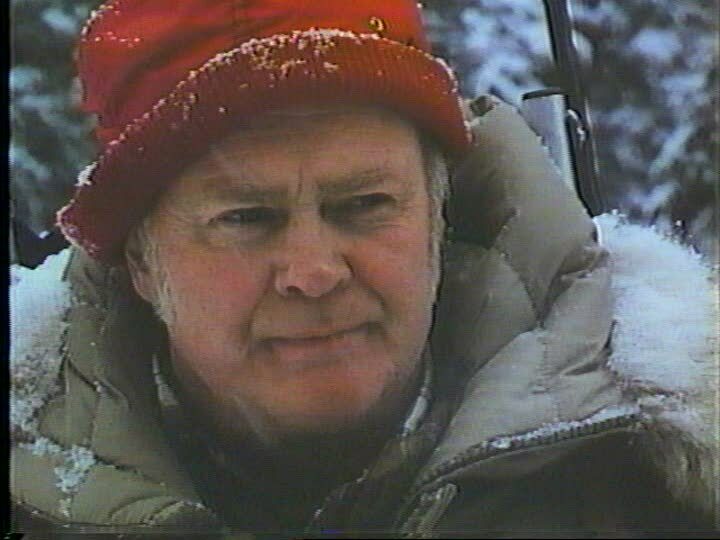 Despite never directly naming its setting, Makichuk populates his film with an overpowering sense of rugged Canadiana, including snowmobiles, the familiar Hudson's Bay coat, snowsuits, and even a book called " Indian Legends of Canada." 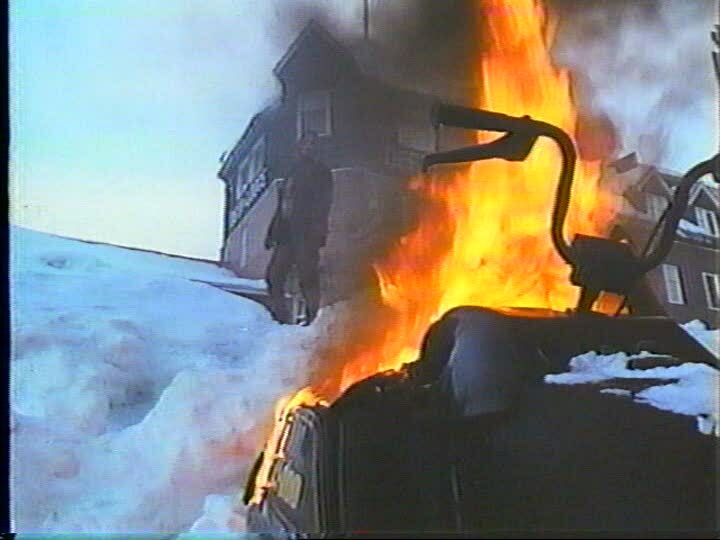 Likewise, the snow-bound landscape figures quite prominently in the film, so much so that it almost becomes a character itself--it appears that Jenny and her friends frequently peep out of windows just to give cinematographer John Holbrook a chance to have his camera sweep over yet another backdrop of snowy evergreens and steep mountaintops. Though it has trouble maintaining suspense for its entire running time, Ghostkeeper is still reasonably stylish, which is why it's somewhat surprising to see that Makichuk struggled to keep his hand in Canadian film throughout the 1980s. A former local news cameraman for Global, as well as a collaborator on Phillip Borsos' award-winning shorts, Makichuk moved to Calgary in the late 1970s to direct commercials and corporate films, ultimately starting work on Ghostkeeper under the safety of the tax shelter boom. The film was widely distributed by New World Pictures and was a frequently seen rental title in the early 1980s, but Makichuk wasn't able to parlay this success into a follow-up feature, instead focusing almost exclusively on straight-to-cable films, even briefly surfacing in Hamilton, Ontario to make two shot-on-video flicks for notorious micro-budget house Emmeritus Films. Given its potential for creating a distinctive Canadian horror film, it's hard to classify Ghostkeeper as anything but a failure. Though the film does work in fits and spurts, it really struggles to balance the crowd-pleasing genre fun of the creature feature with a more adult, serious exploration of human relationships, and it ultimately works as neither. For now, the Wendigo must remain patient in its snowy lair before some intrepid filmmaker truly lets the fearsome beast loose on the Canadian filmgoing public. ©1999-2017 The content of this site may not be reproduced without author consent.